Einen ausführlichen Gastkommentar von Benjamin Hossbach [phase eins] finden Sie in der September-Ausgabe. Ereignisse starben mehr als 100 Menschen – bekannt als die „Heavenly Hundred Heroes“. 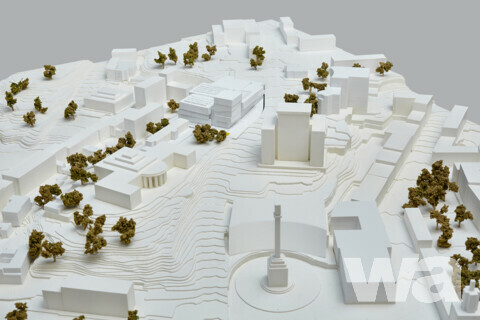 Die Wettbewerbsaufgabe besteht aus zwei Teilen: dem Maidan Memorial (das Nationale Denkmal für die Heavenly Hundred Heroes wa 5/2018) und dem Maidan-Museum (Revolution of Dignity Museum), beide im Zentrum Kiews. Das Maidan-Museum soll ein multifunktionales Museum im Rahmen des Ukrainischen Institutes für Nationales Gedenken sowie eine staatliche Institution der wissenschaftlichen Forschung, ein Ort für die kulturelle, pädagogische und methodische Aktivitäten sein. Gelegen an einem authentischen Ort der Geschichte soll es dennoch mehr sein als nur ein Ort der Erinnerung und Ausstellung der Vergangenheit. Wechselnde Ausstellungen, Veranstaltungen, Konferenzen, Workshops und Alltagsleben machen es sowohl zu einem aktiven Zentrum als auch zu einem Symbol für zivilgesellschaftliches Engagement, Demokratie und tolerante Gesellschaften innerhalb Europas. Die erste Realisierungsstufe umfasst die Konzeption eines Informationszentrums. Es soll die bestehende Struktur des vorherigen Cafés aufnehmen. 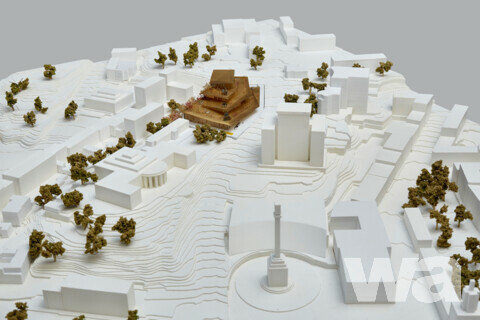 Das Gebäude soll Ausstellungen zum Maidan Memorial und zu den Ereignissen von 2013/14 beherbergen sowie Treffpunkt und Ausgangspunkt für Führungen werden, erwartet wird eine Größe von ca. 600 m2 BGF. Die zweite Realisierungsstufe umfasst das Maidan-Museum mit einer Größe von ca. The Revolution of Dignity Museum (Maidan Museum) is a multifunctional museum within the framework of Ukrainian Institute of National Memory and will be a state institution of scientific research as well as a place for cultural, educational and methodological activities. Located on an authentic site of history it will cater for changing exhibitions, events, conferences, workshops and everyday life; it will be both an active center and a symbol for civic sense, democracy and tolerant societies within the European family. Die Jury empfiehlt einstimmig, den ersten Preis zu beauftragen. The project exhibition of Nomination 2 - Revolution of Dignity Museum will be open from July 13 until August 13, 2018 on the 1st floor of the House of Architects: Kyiv, B. Grinchenko Str., 7. Hossbach Lehmhaus Gbr [phase eins]. Creating of the Museum of Revolution of Dignity on the Heavenly Hundred Heroes Alley in Kyiv, Ukraine. – to take into account the previous work for museumification of Revolution of Dignity field and to raise a question of the future of Ukraine by the architecture and arts instruments. The plot is situated in the central part of Kyiv, exactly on the place of tragic events of the Revolution of Dignity. – zoning of the complex that includes museum zone and public space. – decisions for the existing historical objects and artefacts of the Revolution of Dignity. Competition proposals must be submitted anonymyously in accordance to the conditions of the competition. The admission area is unrestricted in terms of countries and regions. Eligible for participation are individuals who, through recognition by the professional body in their country of residence, on the day of the announcement of the competition were entitled to use the occupational title “Architect”. Individuals from countries where the occupational title “Architect” is not subject to statutory regulation are eligible, provided they hold a degree or similar certificate of professional aptitude that it is recognized in the EU under 2013/55/EU (EU directive on recognition of professional qualifications). Eligible for participation are also architect consortia formed of individuals and legal entities that include at least one person eligible according to the previous paragraph. Legal entities are only eligible in such consortia if their statutory objectives include planning activities relevant to the competition task. Legal entities and architect consortia must name a single authorized representative who will be responsible for the fulfilling of the competition requirements according to the previous paragraph. The authorized representative as well as all authors of competition entries must meet the eligibility criteria applying to competitors. Notwithstanding the designation of a single authorized representative, each member of any consortia shall be jointly and severally liable for any submission from its consortium. In addition, every participant who advances to Stage 2 and submits a detailed design concept conforming to the requirements laid down in the competition brief will receive a flat-rate fee of Euro 15,000 in respect of expenses incurred. To apply for participation, an online form provided through www.competition-maidan-ukraine.org/ must be filled, printed and submitted as hard copy with signature in original for the address of the organizer of the competition.